Every week, we'll be sitting down with one of our gallery artists to discuss their work, process, inspiration, and stories. This week we're speaking with Deborah Zlotsky. 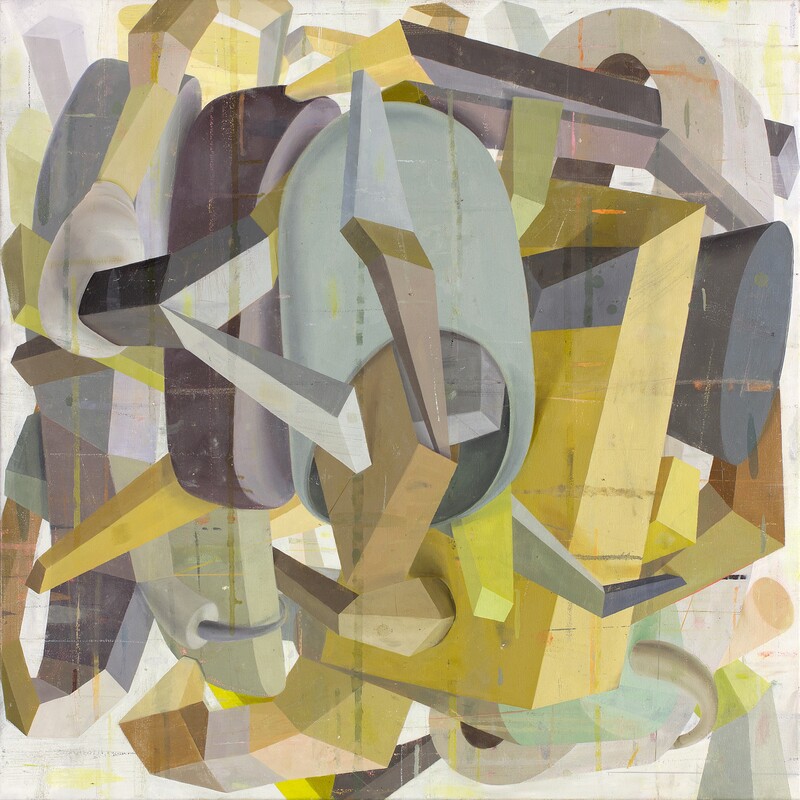 Deborah Zlotsky's work has the ability to feel like it is evolving before your eyes. 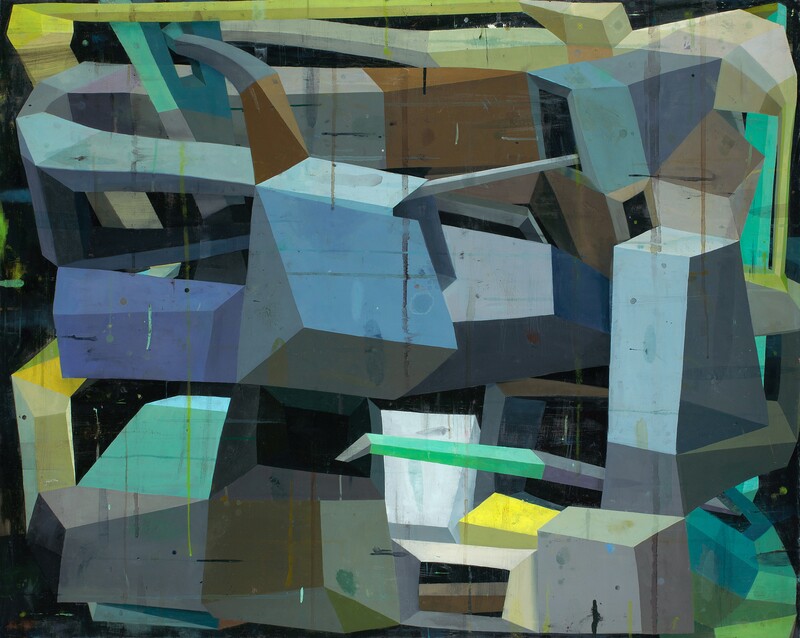 You know the piece itself is static, yet the forms - at once geometric and gestural - appear to compete for space within the plane, pushing and pulling from background to foreground. 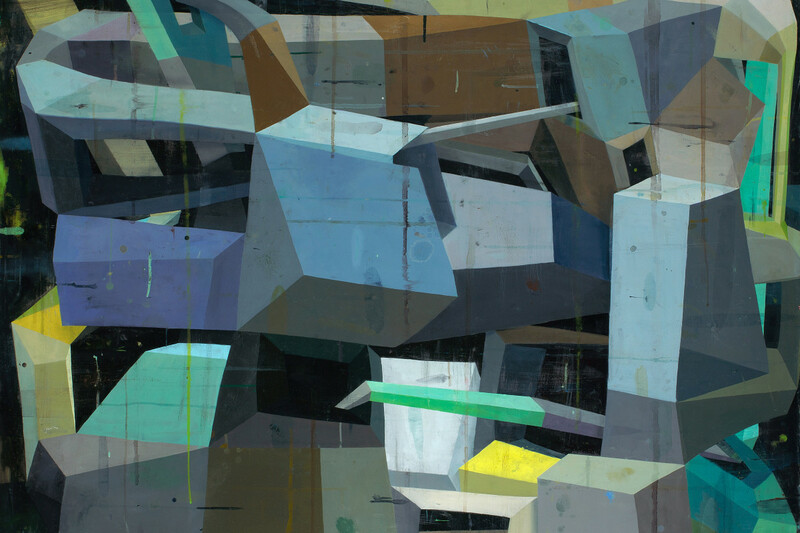 Zlotsky relishes this quality of painting, animating the work by leaving evidence of its previous forms in drips and faded ghosts throughout the canvas. It echoes her process as she discovers the colors, shapes, and compositional relationships through a combination of intuition and intention, a constant shifting of balance and arrangement. 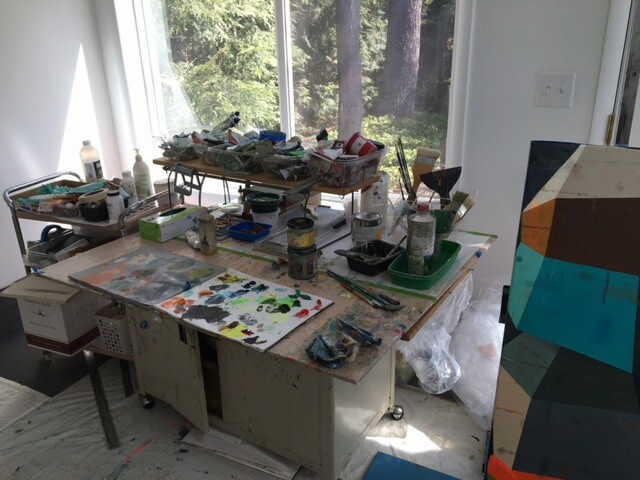 She wrote us from her studio to discuss a process guided by restoring her own work, searching for connections and answers as a piece evolves, and how she moved away from a more academic approach framed from her training in art history. What are your earliest memories relating to art? When I was growing up, my two older sisters were the ones with the obvious art-making skills and interests in our family. I drew a lot, as many children do, and I loved to make things out of scraps of wood and hardware that my dad kept by his workbench in the cellar. So I didn't even consider being an artist, despite taking some studio classes in college, until I moved from the East Coast to Albuquerque for an MA program in Art History at the University of New Mexico and I was surprised to realize I had a stronger and deeper desire to paint and draw. My understanding of art-making was pretty meager though, and it took many years to figure out how to move away from an academic approach - which is more useful for thinking about art that has been made - toward being a maker of art, which requires a different, though complementary, set of values and concepts in responding to visual ideas. How do you think that starting to work as an artist relatively later in life has affected your approach to your work? Compared to more typical art students who identify their interest in high school or before and enroll in a rigorous undergrad studio program, my decision to study art came late-ish. I started in earnest at age 25 in the MFA program at the University of Connecticut. My time to study and make work without other responsibilities was severely compressed as a result. It was compounded by beginning to teach painting and drawing in a full-time tenure-track position at 27, immediately after I completed my MFA. I was still in an early process of learning how to think and make as an artist while also learning how to teach and, fairly soon after that, learning how to parent. My learning curve ended up being extra steep, but I don't think it was all that unusual, especially for a woman. Integrating all three diffused and slowed down my process, and in many ways, the frustrations and elations I experienced turned into the subject of my work. I make a lot of tiny compositional drawings in and around a visual idea in a small sketchbook I carry with me. I make pages and pages of these studies-I can't even really call them drawings- and I begin a new painting with them as a launching point. Usually I have an idea about a set of color relationships that help start the process; however, as I move forward I become more interested in the character of the structure, how it suggests a narrative idea. When that happens, the color goes off the rails. I then have to find a new way back into color, and I have to be more decisive about my choices or I'd lose myself in an endless loop of constructing and reconstructing. Of course, the separation between color and structure is not as clear as I've described, as the color makes the structure to a certain extent and vice versa. My process is all about discovering a structure that emerges through assembling and revising. Lately I've been thinking of myself as more of a repairer than a constructor. What are your influences and inspirations? What elements are most important to you in your pieces? Could you talk a bit about how you work with color? Color is sensation. It's like food to me. And it's the same with light and space. All three-color, light and space-merge in fundamental ways. I grew up walking in the woods every day to experience a fullness of sensation that seemed essential to balancing out the intellectual and emotional intensity of being at home or being at school. I craved being released into the weather-the quality of light and air and smell-and noticing the color permutations of nature. My paintings offer a chance to explore relationships of color, light and space in a similar way. Both my paintings and drawings give me entrance into that pleasure zone of sensory experience. "To the next moment and the next"
What are you inspired by when it comes to titling your work? Your titles are almost cinematic; do they reveal a narrative to the piece? I title my paintings with fragments of phrases, poetry, fiction, nonfiction, news articles, and other essays and statements I read and hear. For me, the closest literary equivalent of a painting is a poem, so allowing the painting to become attached to a sliver of a phrase creates an intellectual and emotional equation for me. The title usually refers to ideas about transition, about ambiguity between things-events, individuals, situations, etc. I'm drawn to notions of getting close to understanding, but perhaps failing a bit to get to a place of total resolution or clarity. What's the relationship between your drawings and your paintings? What do you explore in your drawing that's different from what you explore in your painting? My process of painting and drawing is very similar. In both, I'm starting out with the barest of visual information, and I then build ways for the structure to continue, propelled by accidental marks and guesswork. I'm continually attempting to understand the way the structure can proceed. In the drawings, the language is shaped by the smooth and velvety way powdered graphite clings to the mylar and the gentle way I additively and subtractively manipulate the graphite with air, cloth and eraser. In the paintings, I have to work more actively to create relationships and find interrelationships, although I do scrape and sand at moments to re-engage passages and allow a history to develop. There's a long period of time that's needed to build relationships in both the drawings and paintings. It's just that the paintings reveal more of that sense of time elapsing or compressing, while the viewer isn't privy to accidents and detours that happen in the drawings. As a result, the drawings seem more seamless, more intentional. Explore more of Deborah Zlotsky's work here. 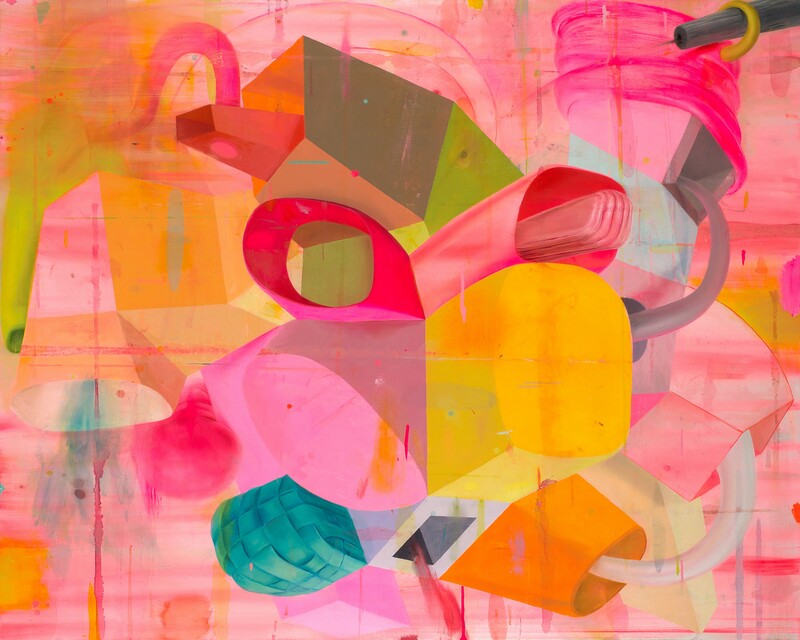 Deborah Zlotsky is a master of color, space, light, and surface. Her paintings are so well formed, at once harmonious and vibrant. Gorgeous work!